The Wilkinson of canes : Henry Howell & Co.
One of the most renowned cane maker of 19th century Britain. The different swordsmiths of the 19th century are well known in HEMA circles, Mole, Weyersberg, Klingenthal or Wilkinson are all names that are easily recognised among collectors and fencers alike. Although there are many aficionados of walking stick combat through the different styles of Bartitsu, La Canne or Irish Stick little attention is given to the famous cane makers of the time. This is why today we will explore the history of one company which could probably be best described as the Wilkinson of canes; Henry Howell & Co. The Howell Company was founded in 1832 London by John Howell at 76 Aldersgate, but it is only in 1859 that the company really became known for its canes under the leadership of John’s son Henry. Henry married into a cane maker family and started his own shop which merged with the original one in 1867. The company expanded to become one if not the biggest producer in the world, employing nearly 500 people and reached its pinnacle around 1910. While of course not every walking stick was meant as a self defense implement, the Howell Company made sticks out of extremely resilient woods and tested each their sticks for solidity. A gentleman looking for a cane to defend himself in England or America would have probably felt confident carrying a Howell cane. 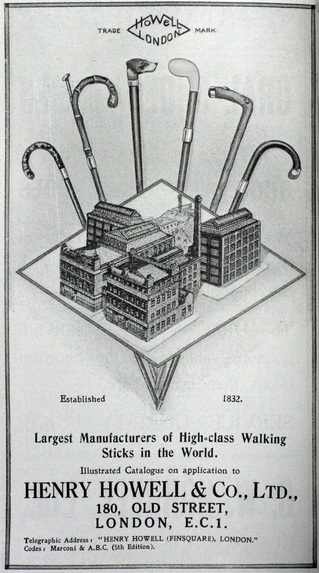 Unfortunately for the company the Great War killed many of its expert employees and in the following years fashion became much more sober, slowly letting go of the cane as an accessory leaving it only for those who needed it as a walking aide. The recognizable marks of a Howell stick are the button which is a disk usually containing the inscription “Howell London England”, a practice quite similar in nature to Wilkinson’s “Proved” disk. The letters J.H. can also befound on the cane, although other makers copied the practice. Also some of the sticks will bear the mark “tested” and sometimes will identify the type of wood used for the shaft such as ironwood or ironbark two types of woods well known to users of fighting sticks today. 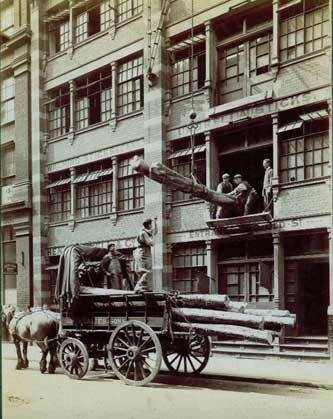 Timber being delivered at Howell’s factory. 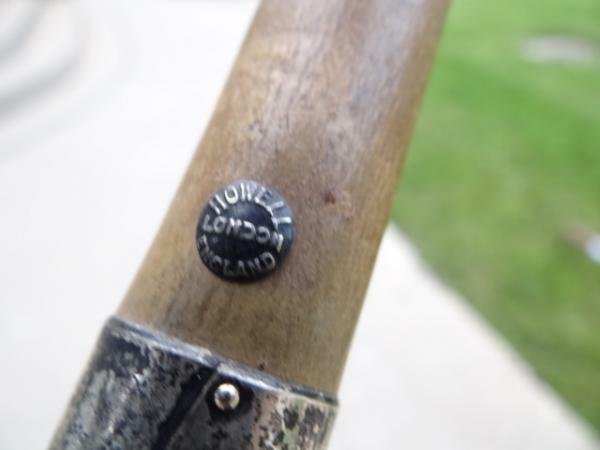 It’s obviously an old wood cane, and it’s made by Howell!! It has the 1/4″ Howell, London, England silver button embedded into the stick, which is what caught my eye. It’s a simple cane with a curved handle but at the very end of the curve, at the bottom, is an enlarged knob of a blond natural color that was either placed there or perhaps it is an actual part of the wood, I cannot tell. Obviously that knob was intended so the owners hand would not slip off the curved end. It has a red and black line drawn or painted on the edge at the border where it meets the darker handle on the curve. I guess you could say the handle with that knob looks like the top half of a question mark. That’s the best way to describe it. The wood has a unique finish to it, has sort of an irredescent bronze sheen to it, but it is still wood colored, darker than the blond knob on the end, and the grain still shows, but it is a very strange grain. Not sure what kind of wood, although this blog mentions Ironwood, or Ironbark. There are two or three very faint knots along the shaft which are risen very slightly, and add to its beauty, and the blond knob contrasts very beautifully against the darker stick. 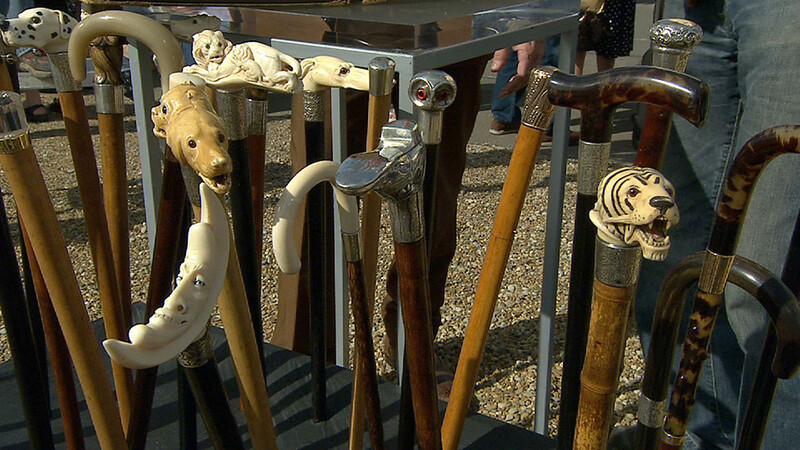 The cane is very handsome, in excellent shape, and was obviously well taken care of over the years. I saw a web site which told me that Howell began his company in London in 1832 and was a very well know cane maker, so that is also a reason I am now so interested in it. It could be a treasure hiding in the closet I suppose. Any ideas of the age or the value of this cane? Unfortunately I am far from a cane expert myself. 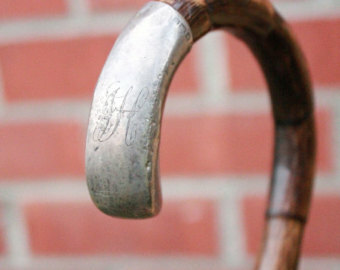 Howell used many types of woods to make canes and the presence of the button could help you date it (I can say it is not one of the later examples). There are few resources on the net but Howell being a fairly popular item for collectors I am sure you will find something. I’m happy that this blog could help you identify a family treasure! Thanks Max. Maybe this would help, a better description of the end of the handle. It’s a normal looking cane but the end of the normal cane curved handle looks like a bulb. You could think of its shape as a large drop of a syrup type liquid, or maybe a small elongated light bulb hanging upside down. Almost like a blown glass shape, but it is blond wood, whether a part of the tree they used and shaped themselves, or a seperate piece they attached….. of that I cannot tell. Hi. I’m looking for an e-mail address of Chris Howell. He is busy with research on the Howell cane sword factories. I’m looking for sales data on cane swords which was made prior to 1905. I’ve got a beautiful cane sword that belonged to Winston Churchill and he brought it to South Africa when fighting in the Boer War. 1899-1902. This cane sword did not return to England with him. Sorry I’m afraid I can’t help you with that. I hope you find more info though.